Garage doors are a very important parts of our homes and businesses, for both the style that they add, and the functionality that you rely on daily. For over a decade, Sound Door Services has been your trusted and reliable garage door company serving the Redmond area for new installations, repair services, openers, springs and more. Our professionals will work with your specific needs to install the perfect door for you in terms of both operation, and design. 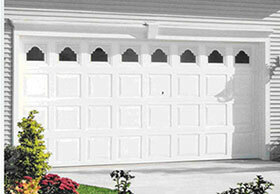 We also know the huge inconvenience that comes with a broken or malfunctioning garage door. Sound Door Services provides complete repair services for garage doors, as well as openers from top brands like Liftmaster & Genie. Wherever you are in the Redmond area from the downtown area to Sahalee and Education Hill to Overlake, as well as the surrounding areas of Kirkland, Bellevue & Sammamish – contact us today for emergency repairs, or to view new garage doors from Northwest Door, Amarr & Wayne Dalton. You can rest assured that new installations and repairs will be completed properly. Our professionals are bonded and insured. Whether you own a home or a business, there are thousands of color, design, and function options to choose from when it comes to choosing a new garage door. Our Redmond area specialists will work with your unique needs, from design to function, and install the perfect door. From steel to aluminum, and wood paneling to heritage wood- there are many choices in color and style to accent your home perfectly. Ask about Wayne Dalton, Amarr, Northwest Door and other top brands. With over 15 years of experience, Sound Door Service has the proven skills to make your garage door run like new again. We believe that with proper care, regular maintenance, and a little bit of instruction, our customers can drastically extend the lifespan of their garage doors. Contact us for bent tracks, broken panels, broken springs and cables, and more! Garage door openers ensure the entire system operates smoothly for your convenience. From new openers, to repairs of your current one – we offer full services for garage door openers from top brands like Liftmaster, Genie, Elite Series and more. We offer a variety of chain drive, belt drive and shaft drive systems to fit your needs. Contact our garage door opener experts today!